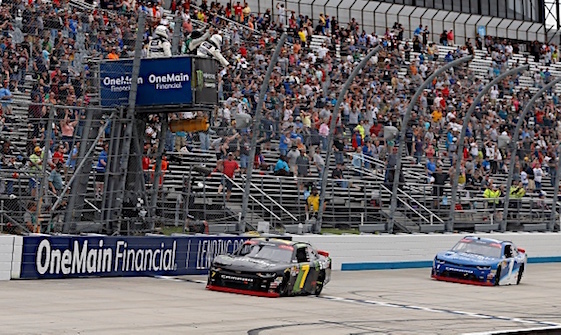 Justin Allgaier bumped doors and then held off JR Motorsports teammate Elliott Sadler to win Saturday’s NASCAR Xfinity Series race at Dover International Speedway. Sadler drove underneath Allgaier’s No. 7 Chevrolet heading through Turn 4. As they came off the corner side by side, the cars touched. Sadler’s No. 1 Chevy twitched loose, and Allgaier’s car slapped the outside wall, but both drivers maintained control, and Allgaier got to the finish line .306 seconds ahead of his teammate. “I thought the 15 (the lapped car of Joe Nemechek) was going to run the bottom,” Allgaier said. “I got on the brakes (in Turn 3) and almost spun myself out. That race—you couldn’t ask for anything better. The victory was Allgaier’s first of the season, his first at Dover and the sixth of his career. The 31-year-old was doubly rewarded, outdueling Sadler for the $100,000 Xfinity Dash 4 Cash bonus that goes to the highest finisher among four eligible drivers. Allgaier is the 10th different winner in 10 Xfinity races this season. Dating to the 2017, the last 13 races in the series have been won by 13 different drivers, tying a series record. Sadler said he couldn’t find a way around his teammate without wrecking him. “I was trying to figure out a way to pass him,” Sadler said. “I knew if I tried to get under him, Justin would do a good job of holding me down, so I was trying to figure out how to create some momentum, especially on the top side, but I wanted to do it the clean way as much as possible, too. Sadler and Allgaier won the first and second stages, respectively. Sadler leaves Dover as the series leader, 33 points ahead of Allgaier in second and 38 in front of Reddick in third. (6) Justin Allgaier, Chevrolet, 200. (4) Elliott Sadler, Chevrolet, 200. (5) Daniel Hemric, Chevrolet, 200. (34) Christopher Bell #, Toyota, 200. (33) Tyler Reddick #, Chevrolet, 200. (11) Johnny Sauter(i), Chevrolet, 200. (2) Noah Gragson(i), Toyota, 200. (3) Matt Tifft, Chevrolet, 200. (7) Austin Cindric #, Ford, 200. (1) Brandon Jones, Toyota, 200. (8) Ryan Truex, Chevrolet, 200. (10) Jeb Burton, Chevrolet, 200. (36) Cole Custer, Ford, 200. (35) John H. Nemechek, Chevrolet, 200. (37) Michael Annett, Chevrolet, 200. (18) Ross Chastain, Chevrolet, 200. (13) Ryan Sieg, Chevrolet, 200. (19) Jeremy Clements, Chevrolet, 200. (12) Ryan Reed, Ford, 200. (21) Joey Gase, Chevrolet, 200. (15) Alex Labbe #, Chevrolet, 200. (25) Vinnie Miller #, Chevrolet, 200. (26) BJ McLeod, Chevrolet, 199. (14) Dylan Lupton, Ford, 199. (30) Chad Finchum #, Toyota, 198. (38) David Starr, Chevrolet, 196. (29) Ray Black II, Chevrolet, 196. (17) Brandon Brown, Chevrolet, 195. (31) Josh Bilicki #, Toyota, 194. (27) Spencer Boyd #, Chevrolet, 190. (39) Joe Nemechek(i), Chevrolet, 188. (23) Garrett Smithley, Chevrolet, Suspension, 169. (40) Stephen Leicht, Toyota, Vibration, 149. (9) Ty Majeski, Ford, Accident, 129. (22) Timmy Hill, Toyota, Transmission, 113. (20) JJ Yeley, Chevrolet, Vibration, 111. (16) Kaz Grala #, Ford, Accident, 76. (28) Morgan Shepherd, Chevrolet, Transmission, 57. (32) Carl Long, Dodge, Brakes, 29. (24) Jeff Green, Chevrolet, Vibration, 11. Average Speed of Race Winner: 98.053 mph. Time of Race: 2 Hrs, 02 Mins, 23 Secs. Margin of Victory: 0.306 Seconds. Caution Flags: 8 for 45 laps. Lead Changes: 11 among 7 drivers. Lap Leaders: B. Jones 1-22; E. Sadler 23-48; T. Majeski 49-52; M. Tifft 53; T. Reddick # 54-76; J. Allgaier 77-93; B. Jones 94-104; E. Sadler 105-110; J. Allgaier 111-129; E. Sadler 130; G. Smithley 131-132; J. Allgaier 133-200. Leaders Summary (Driver, Times Lead, Laps Led): J. Allgaier 3 times for 104 laps; E. Sadler 3 times for 33 laps; B. Jones 2 times for 33 laps; T. Reddick # 1 time for 23 laps; T. Majeski 1 time for 4 laps; G. Smithley 1 time for 2 laps; M. Tifft 1 time for 1 lap.